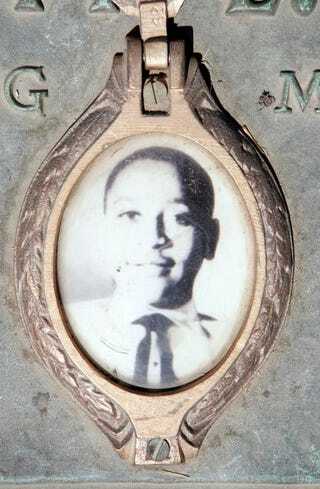 A photo of Emmett Till is included on the plaque that marks his gravesite at Burr Oak Cemetery, May 4, 2005, in Aslip, Ill.
I’m tired and I don’t want to write this, but unfortunately, the story of Emmett Till—a story of senseless brutality and murder, all for the sake of white supremacy—continues to need telling. On Aug. 24, 1955, J.W. Milam and Roy Bryant kidnapped and killed Emmett Till because he allegedly made a flirtatious remark to a white woman (Bryant’s wife). Three days later, he was found dead in Mississippi’s Tallahatchie River. Local authorities packed the coffin with lime, nailed it shut and tried to have a quick, local funeral. At the trial, Milam and Bryant were acquitted after only 67 minutes of juror deliberation. Sixty years later, black people are still being killed, and their killers continue to be protected by local authorities. It is estimated that every 28 hours, a law-enforcement agent or a vigilante kills a black person (pdf). This does not include the number of black people, like Sandra Bland, who die behind bars. Sandra Bland is dead simply because she had the temerity to defy the structurally racist order of things in 2015, in an encounter with a police officer at a traffic stop. This should not be a crime punishable by death. If I thought too much about how defying the structurally racist order of things can mean a death sentence, I would give up. Not because I fear for my life, because as a light-skinned, middle-class black man, I am, in many ways, privileged and try to recognize it. I would give up because the odds of transformative change in this country just seem too long. I’m tired, but I don’t give up because I am inspired by the courage of the families who survive the death of their children. Mamie Till Mobley did what no mother should have to do: bury her child. She held an open-casket funeral in Chicago (where Emmett was from) to ensure that the world would see the horrific murder of her son. She said, “I wanted the world to see what they did to my baby.” She fought for decades against violence committed by white supremacists and against the violence of gangs in Chicago (which also has a whole lot to do with structural racism) (pdf). She fought to protect the sanctity of black life regardless of who threatened it. It is this courage that I have seen move mountains. I never met Mamie Till Mobley or Geneva Reed-Veal, but I did meet Allen Feaster. I met Allen at his shoeshine stand in 2004, just two months after his son Durrell’s death. As a teenager, Durrell Feaster was getting in trouble at school. Instead of being given help, Durrell was placed under the supervision of the juvenile-justice system and sent to a group home six hours away from his dad. Allen was unable to visit his son because of the distance and cost of the trip, so Durrell and a friend stole a car to return home. He was caught and sentenced to the California Youth Authority, then the name of the state’s youth-prison system. Durrell spent the greater part of 18 months in solitary confinement for 23 hours a day. On Jan. 19, 2004, Durrell, age 17, and his cellmate, Deon Whitfield, age 18, were found dead in their cell, allegedly from hanging themselves. Like Sandra Bland’s family, Allen does not believe his son took his own life. Despite the loss of his son, Allen committed himself to winning justice for the children still remaining inside California’s youth prisons. As a recently hired organizer at the Ella Baker Center for Human Rights, I was charged with connecting Allen to other families with children in the Youth Authority. After a dozen families met, we decided to close down the state’s youth-prison system. And after eight years, families of incarcerated youth have closed five youth prisons across the state. Sixty years after Emmett Till’s death, it is still families who continue to pay the price when their loved ones are brutalized by law enforcement and vigilantes, criminalized and incarcerated. And it is still families who are fighting for justice within the very system that failed their loved ones. One year after his son was killed by Darren Wilson, Mike Brown’s father led a march in Ferguson, Mo., to honor his son. Tamir Rice’s family, along with activists and community leaders, directly asked a judge to have the two officers who killed the 12-year-old arrested. And to hold those responsible for Sandra Bland’s death accountable, her family filed a federal lawsuit in August. Families have the responsibility of helping their loved ones heal, navigating the legal system and supporting people as they return home from prison and jail. And yet we continue to fail those families by allocating more funding to prisons and policing rather than to reinvestment in communities. These misplaced priorities still make me tired. But witnessing the enduring resilience and power of families gives me hope that, as Mamie Till Mobley’s foundation says, we will turn tragedy into triumph. Zachary Norris is executive director of the Ella Baker Center for Human Rights and a 2015 Opportunity Agenda fellow.